Home mortgage interest deduction a good idea? Absolutely! 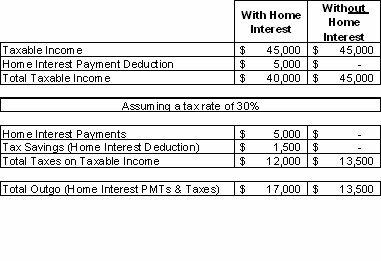 If you have a mortgage and are paying interest, it is very important to take the mortgage interest deduction. One thing I have heard commonly stated is the statement that “I do not pay off my mortgage early because I do not want to lose the mortgage interest deduction.” I believe this saying was initiated by banks 🙂 Here is why. Look at the example below. Let’s say you paid $5,000 in interest on your mortgage last year. By taking the deduction, you effectively reduce your taxable income by $5,000. You receive back the tax rate on that home mortgage interest deduction. If your tax rate is 30%, you get back $1,500 (30% of $5,000). The bank gets to keep the $5,000 you paid in interest. Uncle Sam gets 30% of your taxable income which is now $40,000 because you were able to reduce your taxable income by the interest you paid. The total net OUTGO from you to Uncle Sam and the bank is $17,000! Well, you are living life pretty good in your debt-free condition! So, now you no longer pay interest to the bank (sorry!). This means that you will be taxed on the full $45,000. If your tax rate is 30%, the total net OUTGO from you to Uncle Sam is $13,500! $3,500 LESS OUTGO from you to someone else. So that is why I believe that the banks started the statement, “I do not pay off my mortgage early because I do not want to lose the mortgage interest deduction.” If you do pay off your mortgage, the banks will not get any of your money! THINK and you will prosper!